Dianne here…..thanks to all you commented publicly and privately on my blog post about the alpaca rug and lack of acknowledgment I received. It was interesting to hear how others have experienced the same lack of appreciation but more importantly how you felt about it. So here is one more ‘therapy’ session before I share what I am doing, fiber wise. A couple of years ago I responded to a call for submissions to our local artist’s coop which has a nice storefront. Artists are solicited to apply every couple of years when the members decide they need more artists or diversity in their artwork. If accepted, members contribute to the cost of the storefront, work in the store and pay a % of sales to the coop. I often buy gifts in the store to support the local artists; many of the items are paintings, pottery and jewelry with a little weaving and woodworking. Nothing like our braiding or hooking. I was skeptical about applying for the obvious reasons: I wasn’t sure I wanted to have to produce enough items to sell if accepted, would that be more like a job? Hooked items take longer, would there be a market for them? Tho Kris McDermet and I have made combination hooked bowls which are relatively quick to make-that might work….and of course I worried about being rejected. There it is again, lack of confidence in our own work before others. It didn’t matter that several acquaintances have suggested that I apply over the years. I saw an advantage that I would meet like-minded folks who put their creativity to work, I looked forward to working in the store, and I am a fan of coops. So I applied. I filled out an application, submitted several ‘priced’ pieces which represented what I would put in the store, if accepted. True to coop fashion, the members were asked to come one evening to vote, and we picked up our pieces the next day. I was encouraged when I picked up my stuff because the member coordinating the pick up asked a lot of questions about my braided baskets….but a few days later I got the form letter saying I did not get accepted. The point of this blog is to share my reaction. I thought I had prepared myself for negative results, I really did. But it surprised me to find how disappointed I was when I didn’t get in. More than disappointed, verging on depressed. I couldn’t shake it for a couple of weeks. It led me to some self-reflection (here’s the therapy part) and to consider that most of us do not open ourselves up to rejection as adults. Our long-ago schooling was probably the last time we were evaluated and then we had to endure it. This was different: I asked for it! It didn’t help to think, they only took painters this time around and only 3 out of 13 applicants, I rationalized: I wouldn’t have wanted to produce that much anyway, etc etc…. Will I apply again? Doubt it, but then I have not seen a call for submissions since that time. Part of me wants to share the beauty of braiding/hooking with the outside world, especially the various non-traditional things that can be done, e.g., with fabrics other than wool, baskets, mats, tiny braids, etc. Many of the compliments I have received over the years have been, “Oh I didn’t know you could do that with braids, I thought braiding was just for big room rugs”. Several of you have shared similar stories and I know one friend who has admirably persisted several years to a positive end in a juried situation which in some ways is harder than this, more generic community-based evaluation. Juried folks should know what to look for; I have no idea what my ‘judges’ were judging, probably sale potential since it is a business. And one friend just put herself up for a similar evaluation and we shared our rejection stories and emotions. Enough therapy….tho encourage you to comment. So, onto current projects. I recently finished a combination hooking/braiding project, mainly to show students how to combine both when starting with a braided center. 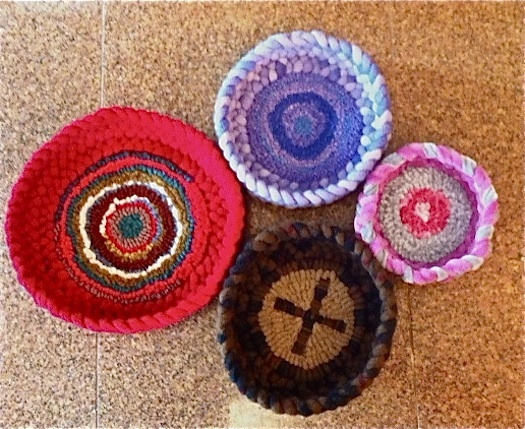 I will be teaching several classes in chair pads for rug hookers and wanted to show them how the round start technique could have an added hooked wreath. Kris has several examples in our book, and I have one, but that is the reason for doing this one. The center is all butted, the hooked wreath done with my hand dyed wool trying to pick up a light turquoise in the plaid, and the last row of braids is a triple picot but with only one loop between rather than 2 to give a ruffled effect. Turns out it is too big for my one wooden chair which has a chair pad already so it might become a hanging! 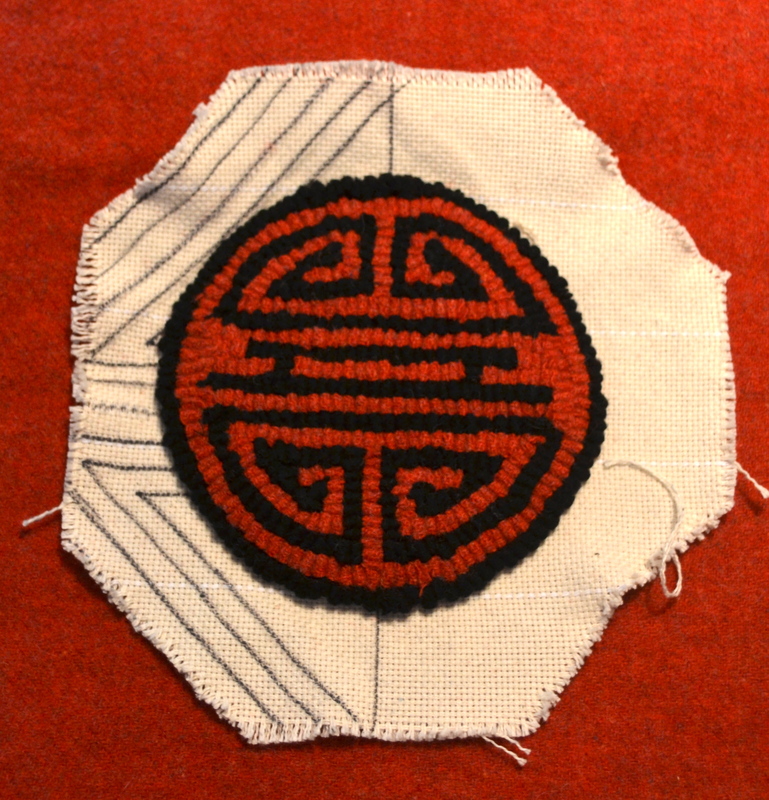 And I am continuing on my muted hit and miss round rug; currently at 65″ diameter but it needs to be 91″. More about that later. Christine here: One of my New Year’s Resolutions was to push myself to try things outside my own comfort zone, which is braiding. I don’t think I’ll ever run out of ideas of things that I want to try next in braiding — I have about 20 rugs sketched in notebooks that I want to make — but I think we are all aided in our creative journeys by mixing things up now and then. 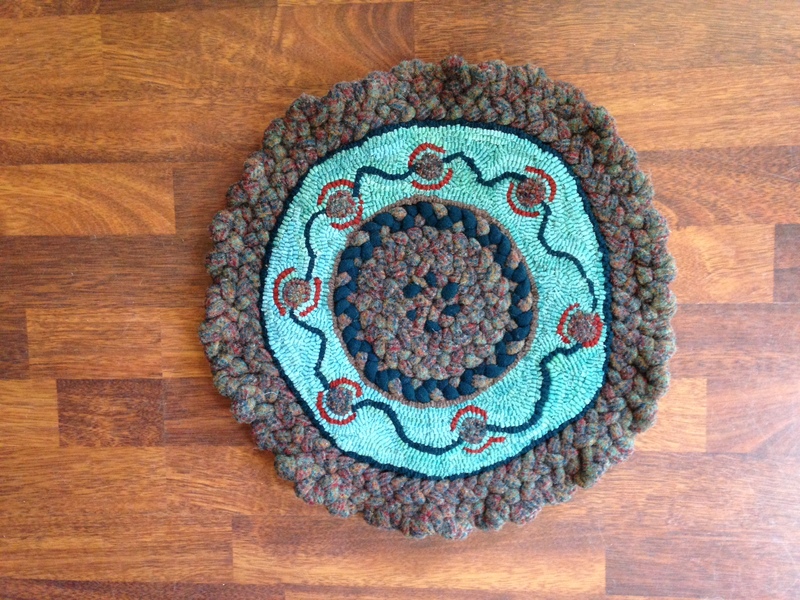 My friends Dianne and Kris have been encouraging me for years to get into rug hooking and…. I have tried, I really have. I find it tedious. I accidentally pull out loops as much as I place them. My loops are twisted, of unequal length, and on top of all that it’s time consuming. 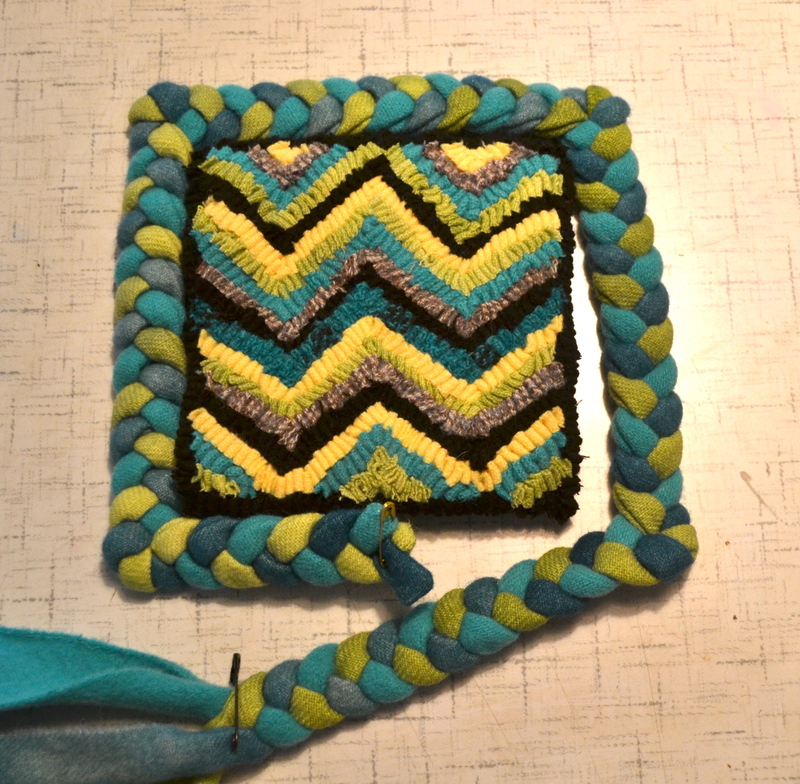 Then, I got tapped to teach rug hookers how to frame their pieces with braids. I said, Sure! After all, I can do anything with braiding, right? Then it hit me that I would have to have class samples that were hooked to show them how to attach the braids. So, I dragged out all that rug punching stuff and the cutter that I had purchased and started working. 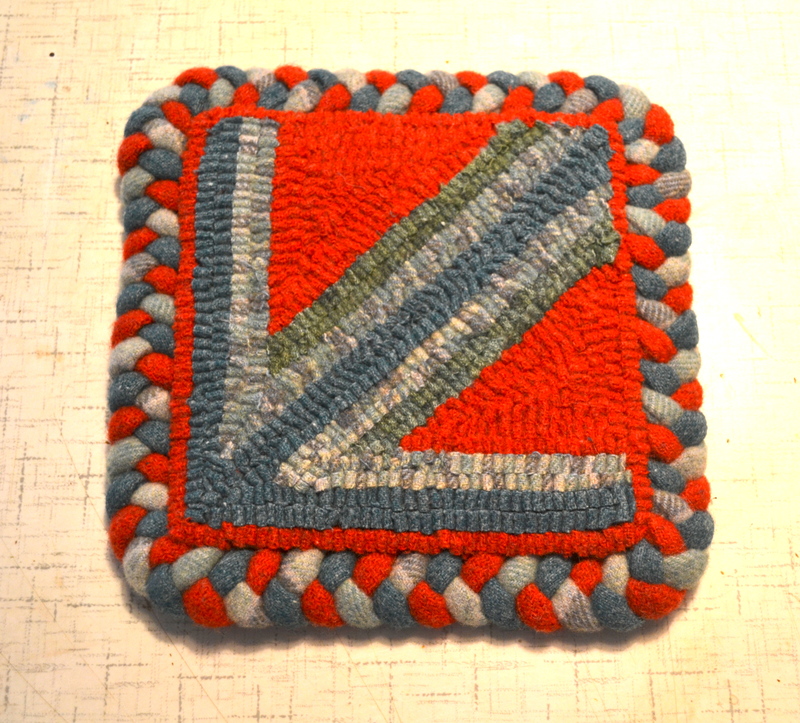 First Rug Punch Piece, with lots of twisted loops. I can tell, just from the progression of the 3 pieces that I’ve made, that I’m getting better. My first piece has a lot of twisted loops, but I learned how to straighten out the long 1/4″ strips before I started punching, and to straighten them out again when I changed direction. My second piece I made too crowded, and my 3rd piece is the best — loops and rows more neatly spaced, and fewer twisted loops. The best part of all of this? Each piece took me less than 3 hours from start (picking out fabric) to cutting to punching to finish (steam pressing on the back). 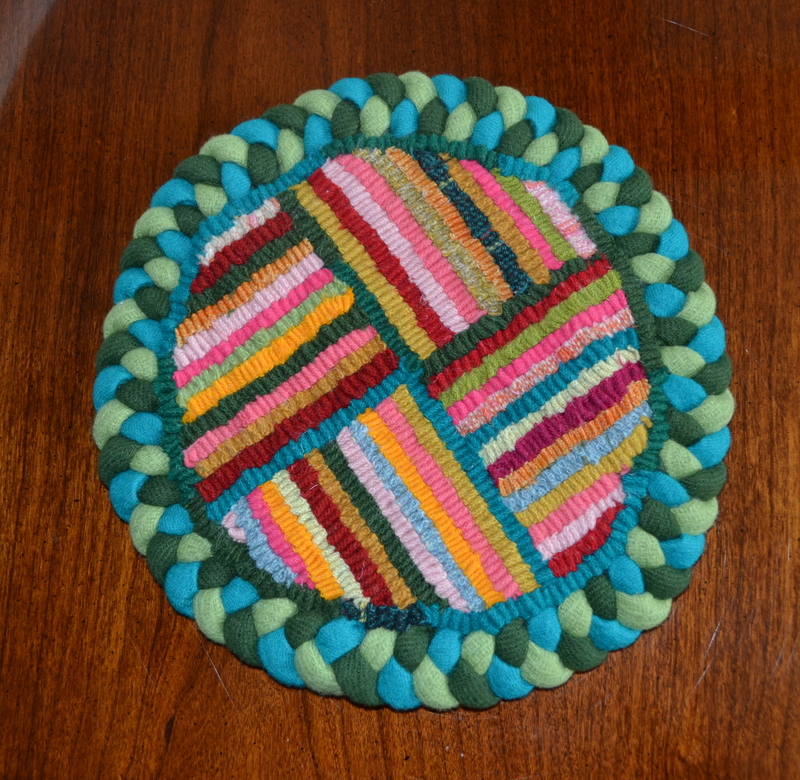 I don’t remember exactly how long my first rug hooking piece took me, but it was nightmarishly long — several evenings. What a difference! Here are examples of my class pieces. They are in various stages of completion so that I can demonstrate each technique needed to attach braids. No, they are not perfect, but they will “do,” and best of all, it went quickly enough that I might actually try it again. By this last piece, which I think looks pretty good, I was much better. No, it’s not as perfect as the rug hooked loops my friends make. But, I can see that if I kept up with this, I could probably get to an almost equivalent point in the appearance of the loops. And it was FAST! What does it take to feel valued? Dianne here: This may well be a more personal blog post….it has to do with that we ‘artists’ (or at least this one) need to feel valued or good about our work. What best fulfills us? Should we need any reinforcement other than feeling good about what we have produced? Is money a realistic reinforcement? How about criticism (maybe that for another day). You might remember I shared the braiding of the alpaca rug (http://wp.me/p4qaPu-2Z) I made for my 27 year old daughter’s friend. I had made a small butted basket for the baby shower at my daughter’s requ est and subsequently the friend’s husband contacted my daughter to commission me to make a large rug for the baby’s room as a surprise for the new mom. We settled on a very reasonable price for a large oval for in front of the changing table. This was in the fall and the baby was due any day….so I worked hard on finishing it; I took it to an extended braiding event trip and practiced a new butting technique on the many butted outer rows…and Christine gifted me with more green after I ran out of the original color. I shipped it off to the husband at his work and heard nothing, but eventually did get a check and after nagging my daughter, he told her he loved it….but we heard nothing from the mom. Baby was born, still nothing. Actually nothing until last week, a good 4 months after I sent it. What did I expect and why did I expect it? Was I unreasonable in my expectations? I suppose I expected (and maybe needed) positive reinforcement that they ‘loved it’, that it was the best thing ever, etc. etc. Why did I need that? I think because when we put ourselves ‘out there’ by exhibiting, selling or fulfilling a commission, we are vulnerable. Even if we KNOW we like the results, we are unsure about others. OR if we aren’t sure about the results, if we have taken a chance and done something new and different, or put colors together we aren’t sure about (as in brown, green and white for a baby’s room, as was requested! ), we crave feedback, even if it is negative (as long as it’s gentle). I talked to my daughter at length about this and she began to understand how I felt. She was embarrassed for her friend, yet she did not want to flat-out ask. The friend now lives in another state and they don’t talk much. I think the episode was a teachable moment because my daughter saw how disappointed I was not to have heard, and I think she has a better appreciation of thank you notes now….we’ll see. PS: Daughter talked to friend last week and friend “loves it; whenever she goes into baby’s room, the rug reminds her of my daughter”.